That includes bestselling books, magazines, TV shows and you even get $5 store credit. TouchWiz has been stripped in favor of B&N software but other than that the tablet is the same. It has a 7″ screen with 1,280 x 800 pixel resolution. That makes for 216ppi pixel density, an important metric when it comes to reading. You get 216ppi from Amazon’s Kindle Fire HD ($154 sans ads) but do keep in mind that the Tab 4 Nook has full access to Google’s Play Store, so you also get apps (but also books, movies and music) from Google instead of just Amazon. You also get two cameras (3MP on the back and 1.3MP on the front), a microSD card slot and Bluetooth, all of which the Kindle lacks. Other connectivity includes Wi-Fi a/b/g/n and GPS+GLONASS. 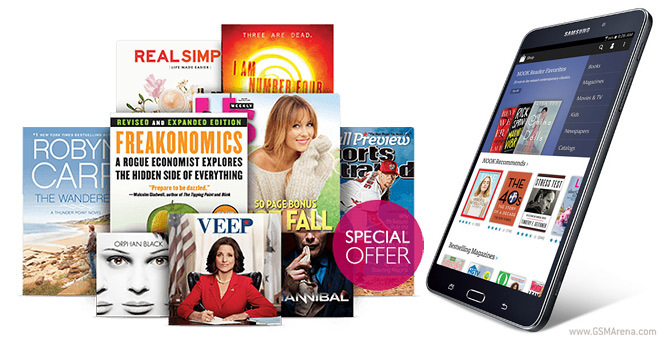 The Galaxy Tab 4 Nook is powered by a quad-core processor with 1GB RAM and supports Samsung’s Multi-Window feature. There’s no word if it will be available outside the US.